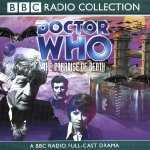 Released: 1993 (Cassette), 2000 (CD) BBC Worldwide Ltd.
After a skirmish with an alien warrior in the Middle Ages, Sarah Jane Smith's life as a journalist in Croydon seems rather tame. She decides to track down the enigmatic character who took her back in time; with the Doctor, a good story is never far away. Her intuition pays off.